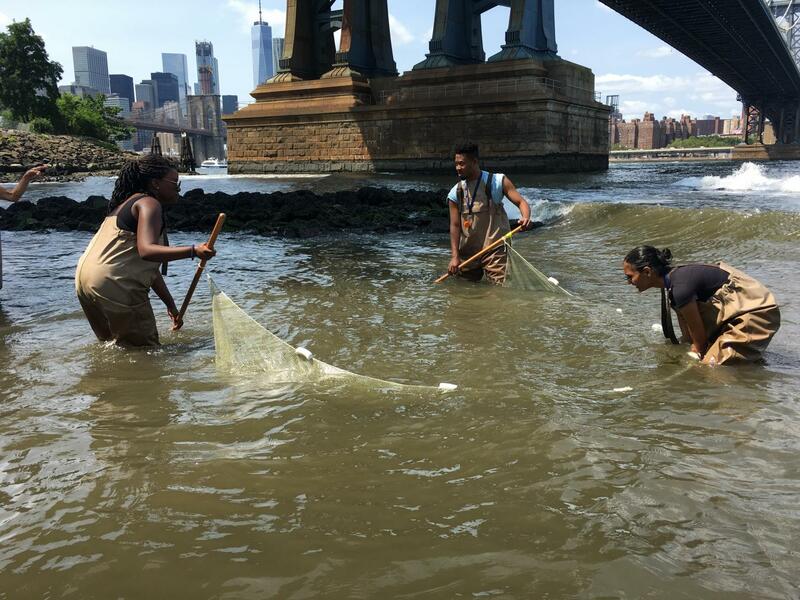 From horticulture projects to education programs and coastal cleanups, there are plenty of volunteer opportunities at Brooklyn Bridge Park. Amanda Haynes is one of our more engaged volunteers, participating in multiple programs in the park every year. Let’s get to know more about Amanda! Amanda Haynes (left) and other volunteers drag a fishing net during a seining program in the East River. As part of the Education Program, their goal is to catch, identify, and release fish and invertebrates to learn about local marine habitats. I’m a very active person so when I’m not in the park I’m either biking, taking a hike, walking, working out in the gym, doing hot yoga, or going to a new restaurant because I’m also in love with food. Please describe what you do with the Conservancy. I’m part of Green Team. We take care of the plant life— weeding, mulching, and making the landscaping look beautiful. I also seine the waters for the sea creatures that live in the East River and volunteer for Earth Day and the Harvest Festival. I assist in the Environmental Education Center, too, and help with Coastal Clean Ups when the tide is low. What piqued your interest in volunteering at Brooklyn Bridge Park? Honestly, when my ex boyfriend broke up with me, I felt that I had to channel my energy into something that I loved doing. One of my passions is horticulture and taking care of plants—I’m in love with the environment. So in addition to me painting and designing flower pots, I decided to volunteer for Brooklyn Bridge Park as well. And I’m happy I did because I’ve learned so much about plants and the park itself, and it’s led me to other volunteer opportunities as well. It was the best decision I’ve made. What’s a highlight moment you’ve had in or around the park? One of my highlights was when I volunteered for Earth Day and I met Bruce Beck the sports anchor [from NBCComcast]. He was really fun to work with. The very next day I received a couple of phone calls from friends and family saying they saw me on the news. Even though a camera crew was there, I had no idea I was going to appear on TV. That was pretty cool. What I love the most about the park is the scenery. I could never get tired of the view of the city, the bridge, the boats passing by, picnics when the weather gets warmer, movie nights, the ice cream shop, the Lizzmonade stand, the new up-and-coming restaurants, and activities at the piers. There’s so much to take in, it brings me peace and serenity. Is there anything else you’d like to share about your experience in the park or the people you’ve met here? I’ve gained really close friendships with awesome people by volunteering. Volunteering for the park has added so much value to my life. And I am grateful for how Brooklyn Bridge Park Conservancy staff appreciates their volunteers.